the story goes that the romans, when repeatedly attacked, the slingers were reduced to sticking theor thmbs n the dirt and pouring lead into the holes because they couldnt otherwise make bullets fast enough. my question, what sort of things should i be worried about, using either wet or dry sand? or even clay? or even thick tinfoil wrapped around my thumb in a well sealed manner and stuck in sand? I cast lead bullets for my muzzleloader a few times a year. Basik precautions apply mostly to not pouring molten lead on yourself. I have as an experiment dropped molten lead on a piece of ~3-4 oz shoe leather and it did not burn through. As far as problems with water... not going to try that but your can google leidenfrost effect with lead experiment where someone dips their finger in water and then quickly in and out of a pot of molten lead.... mythbusters did that I believe last year... not something I would do but no explosions. Only thing I would recommend when using a mold (mine are steel and aluminium but I have also seen ones made from soapstone is to coat the inside of the mold with a bit of soot from a candle to prevent any possibility of you soldering your mould together. The idea of pouring it directly into a depression in say sand... just take a tin can... fill it with sand... make the thumb impression and pour in the lead... the term for this is sand casting and is still done today in industry/hobbyists. Mind you, with something more precise than a thumb but I think you will be suprised how accurate a copy of your thumb you will make in a sand mold. I'm guessing you were inspired by my own experiment? "A wood gang mold for casting lead sling bullets. Above it at left is a repro made in a rubber mold taken from an original bullet. Next are 3 from this mold. 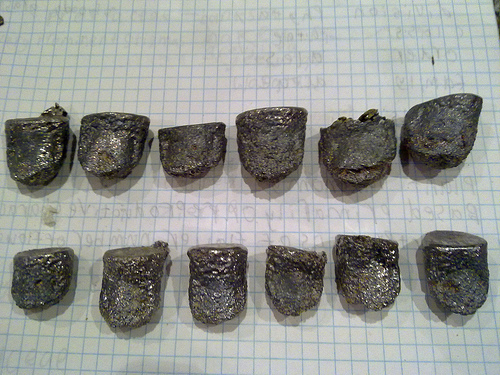 At right are 2 made by poking my fingers into damp sand and pouring molten lead into the holes, as was done at Velsen. For more slinging info, see http://www.slinging.org." And of course my own work was inspired by an article called "Pouring Lead in the Pouring Rain", covering experiments done at Velsen at one of the Roman Military Equipment Conferences. So yes, damp sand works fine. You may get some hissing and steam, but no explosions. Dry sand won't hold the impression well enough, though that may depend on the sand. 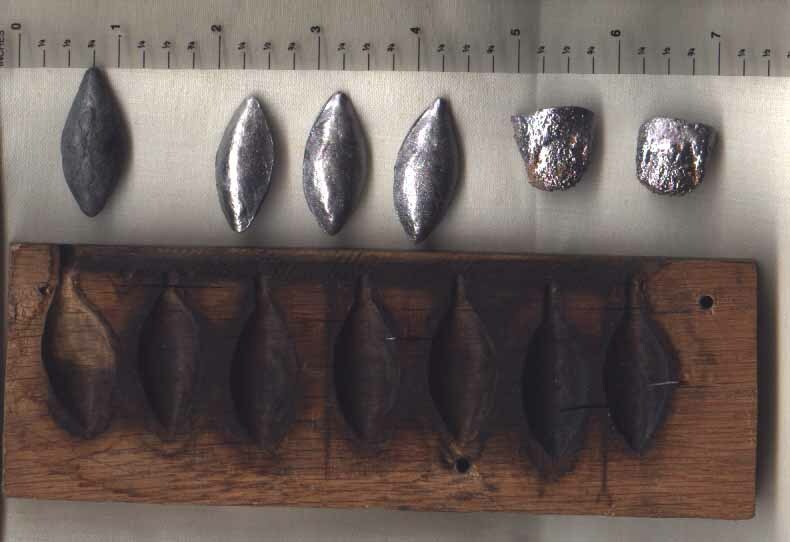 Some of the Velsen bullets were made by poking conical holes in the sand, maybe with a buttspike, and casting the bullets in those. At first they'd hammer the wide end into something more conical, then they just used them "as is", and THEN they started sticking their fingers in the sand! Must have been a fun afternoon (the battle, I mean, though I'm sure the conference was fun, too!). i was worried about wet molds because empire tota; war mentioned that when casting cannons, a damp mould caused a steam explosion that DESTROYED THW WHOLE FOUNDRY. i realise theres a difference between lead and molten iron or bronze. but i think afer an anecdote like thatyoud understand my concern. wait, is that ALL the bullet was? i thought you made it all the way up to the first knuckle.. not just the end of the fingernail? which for me is roughly an nch long. maybe abit less. as for the velsen bullets allow my to make sure i understand that they made a conical hole in the sand and then reshaped that previously conical bullet into something that pointed both ways. i have paper bullets for the reenactment of marathon here in sydney and on THEM will i write take that and 'a present from william, ive also nicknamed them 'the twelve apostles' in reference to the 12 charges of gunpowder carried by rennaisance musketeers on a bandolier. but of course i wont if theres a big risk of ruining uni property. i realise fully this is technically wrong, and probably breakinga thousand rules. but it might be the most efficiant method of doing this. Ha, yes, that would inspire some respect for the craft, eh? No worries, respect is good. Yup, that's all you need, about an ounce. Remember that a .75 caliber musket ball is about the same weight, c. 3/4 inch in diameter. That's a scale of inches across the top. And I used 3 fingers, not the thumb--more holes at once. Yup. A bunch were found like that. Gloves are good (not for poking the holes, doh!). Try not to breathe the fumes when the lead melts. You can get a whole high-end heavy metal respirator, or just make sure the windows are open and maybe a fan going. A fume hood would be perfect! I just do it outdoors and try to limit my exposure. You really won't be melting all that much lead, but yes, more safety is better than too little! Oh, just MELT the lead--if it gets to boiling, i.e. bubbles breaking on the surface, it's way hotter than you need, AND making far more fumes. Ever pour eggs or something into a hot frying pan? Maybe something that dramatic, but probably less. Don't stick your hand right in it. I don't think I've ever seen lead flying, unless I spill something (which I have!). Oh, when you start slinging, start in the MIDDLE of a very large uninhabited field, ALONE, with nothing even remotely breakable within 200 yards. And then practice with tennis balls for starters. You have NO idea where your first shots will go. If there is a black walnut tree or something else that grows natural ammunition, even better, since you won't have to gather it up afterwards. I believe someone went to a local golf driving range on a quiet day and paid for a bucket of balls to shoot (he DID check with the management, first!). For serious shooting, use stones about the size of the bullets, or a little larger, to avoid lead-poisoning the local flora and fauna. But once you get competent, do try some target shooting with the lead bullets. Seriously, the fumes are more a danger than anything else. But in this hobby, who's gggggonna know the difdifdifdifference, eh? ive been raticing using balls of soaked, then compressed tissue paper as well as other thngs like small potatos, ihavent trid tennis balls since m sling pouch is prety small. Hey, success! Got enough to drive off the next wave of barbarians? Anywhere have pics of original thumb cast sling stones?